In this episode, I interview my friend Jen on how childhood emotional trauma has affected her relationships today as an adult. Even if you’ve never been abused or didn’t experience trauma in the way Jen and I discuss on today’s episode, it doesn’t mean that your upbringing didn’t affect you in some way in how you relate to men and relationships. And if it happened 10 years ago, 20 or 30, and you haven’t dealt with it, there’s a chance it’s impacting your relationships today. 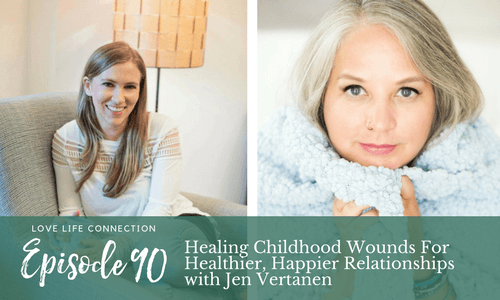 Jen Vertanen is a coach, mentor, speaker, and writer encouraging people to share the hard to tell stories and start to heal the places that hurt. Jen knows the power of telling your story (hers stems from an emotionally abusive childhood) so often that the shame starts to fade away. She is also the creator and host of the podcast Going There with Jen Vertanen where she shares intimate conversations with people working to heal the places that hurt. She reminds people that we are never alone even though it oftentimes feels like it. Known for her candor, willingness to go there (especially when it’s uncomfortable), humor, and openness, Jen is often thanked for asking the hard to answer questions and exploring the dark bits – even when (especially when?) it’s awkward.